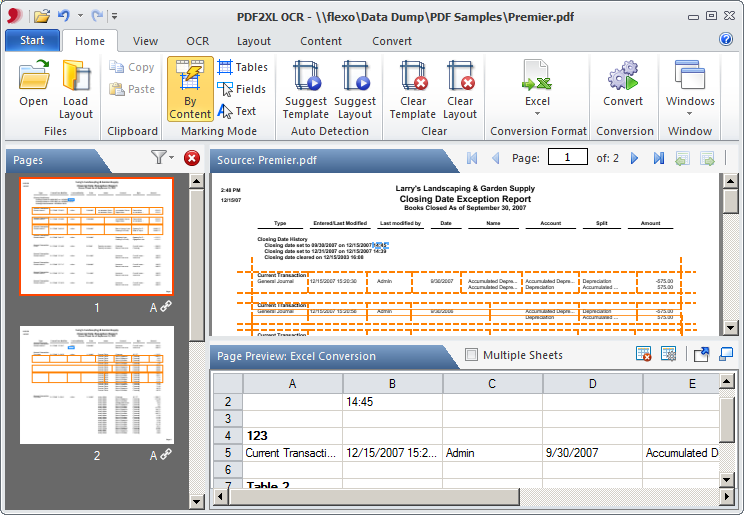 The largest part of the screen shows the document you have opened, and overlays the current layout on top of it. In this window you can mark new tables and fields for conversion into Excel, or modify tables and fields you've already marked. The window on the left side of the screen shows a thumbnail view of all the pages in your document, which you can use for easy navigation around the document. It also displays the current layout on each page and you can right-click on any page here to perform actions with that entire page's layout. The window at the bottom of the screen shows a preview of what the tables and fields you've marked will look like once they're converted into Excel. The Start button at the top left corner of the screen opens the Start menu.